There’s a new mystery in PlayerUnknown’s Battlegrounds, thanks to the appearance of some mysterious chests on the game’s latest map. 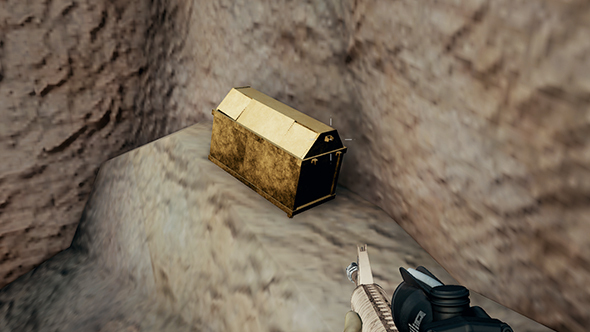 These bright golden objects have shown up in the latest Sanhok map test, but nobody’s quite sure what they’re there for. Do you need help choosing the best battle royale game? Several players have noted the golden chests on Reddit (via Kotaku), though it seems only two locations have been found so far, one in a rock formation by Bootcamp Alpha and another in the forest northeast of the Ruins. They don’t seem to do anything and there’s no option to interact with them, so all we’re left with is speculation. Whatever their actual purpose, the chests are making people think of Fortnite. The other battle royale favourite has its own sparkling chests, and Epic have recently shown a predilection for teasing new in-game events through mysterious new objects in the world. Sanhok – formerly known as Savage – has already drawn some Fortnite comparisons thanks to its small size and faster action, so it may just be that PUBG Corp are paying the inspiration forward. For now, all we can do is marvel at the golden chests in all their marvelous goldenness. (So very shiny.) In the meantime, you may want to enjoy a PUBG stream, which can now be much more action-packed thanks to new Twitch filters. All chicken dinners, all the time.